'I found it important to strengthen the settlement enterprise especially now,' says Sharren Haskel, in tour with Australian parliamentarian. 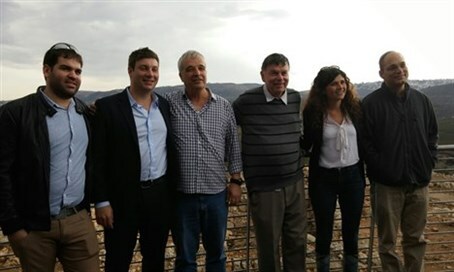 The newest member of the Knesset, MK Sharren Haskel (Likud), toured the Binyamin region north of Jerusalem Thursday. Haskell brought along Tim Smith, an Australian parliamentarian, who wanted to see life in Judea and Samaria from up close. Upon visiting ancient Shiloh, Smith said: "I was very excited to be at such an ancient and meaningful archaeological site." The tour was organized by Shevah Stern and Natan Engelsman of the National Staff in Likud. The Head of the Binyamin Regional Council, Avi Ro'eh, spoke with the visitors about the connection between the nation of Israel and the Land of Israel over history. "This is our land and there is no other," he said. Ro'eh said that there was no logic or justice in the idea of establishing a Palestinian state, given the current state of the Middle East. "We intend to stay here," he said. "The settlement enterprise here is strong and determined. The state of Israel is strong and determined. Any expression of solidarity from the Knesset and the world is welcome, however." MK Haskell said at the end of the visit: "It was important to me to come here especially today, to strengthen the settlement enterprise in these difficult days." The Canadian-born Haskel, 31, replaced Danny Danon, who left the Knesset to become Israel's ambassador to the United Nations. Prior to joining Likud, where she placed 31st on its list for the 2015 elections, Haskel received a degree in international relations and political science from the Open University and worked as a certified veterinary nurse.